If you are like me, there are times that you realize that you have wanted for yourself something that you were not willing to give others. It is so easy for us all to fall into the self-centeredness of seeing things only from our own point of view, of focusing on our own needs and desires to the point that we treat others quite poorly and become hypocrites. As we can see from today’s gospel text, Jesus Christ addressed this common human failing in a memorable and disturbing parable that applies to us all when we refuse to forgive others. A servant owed his ruler more money than he could possibly earn in his entire life. When he could not pay, the master was ready to sell him and his entire family in order to cover the debt. But the servant begged for more time to pay, and the master showed mercy even beyond his request. He actually forgave the huge debt; the man owed nothing and he and his family were safe from punishment. How tremendously relieved and grateful the man must have been. This parable gets our attention because we all find it hard to forgive at least some of the people who have wronged or offended us. Sometimes we enjoy holding grudges against others; perhaps we get a perverse boost to our ego by thinking that we are better than someone else, that we are somehow justified in looking down on them. Sometimes we hate the fact that we hold grudges. We may not want to remember bad things about other people, but unpleasant memories play over and over in our minds and we feel powerless to stop them. Like everything else in the Christian life, forgiveness is a journey, a process of growth as we share more fully in the life of Christ by the power of the Holy Spirit. Notice that the Lord concluded the parable by saying that we must forgive our brothers from our hearts, from the depths of our souls. Though it may be a necessary first step, it is not enough simply to put on a good face and stop saying angry words and behaving badly toward someone who has wronged us. The goal is to be fully reconciled with them, to forgive and forget, to show them the same love and mercy that the Lord has shown to us with a pure and whole heart. Even as we always want God to forgive us when we sin, there is no limit to the forgiving, reconciling love that He calls us to give our enemies. When St. Peter asked how many times he was to forgive his brother who sinned against him, maybe seven times, Christ said, no, ‘seventy times seven.” In other words, we should always forgive; there is never a point where the Christian becomes justified in judging, condemning, and refusing to show mercy. Surely, we all have a long way to go in fulfilling that commandment. In order not to give up and despair about our struggle to forgive others, we have to remember what it means to be in Christ. Most fundamentally, to be a Christian means to participate personally in the life of the Holy Trinity by grace. Jesus Christ bring us into eternal life such that we partake in His victory over sin and death. 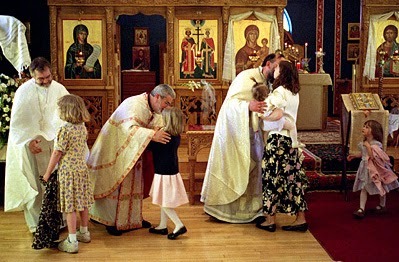 The holiness, mercy, and love of the Lord become active in us, become characteristic of us as unique persons, as we share more fully in His life. The more we find healing and transformation in Him, the more we will extend His forgiveness to those who have wronged us. If we refuse to do so, however, we refuse Christ and refuse to participate in His mercy. When we refuse Him, we condemn only ourselves. In moments of anger and pain, it is usually much easier to judge, hate, and condemn than to love and forgive. Ever since the fall of Adam and Eve, we human beings have distorted our relationships with one another, allowing fear, judgment, and insecurity to divide us. Early in the book of Genesis, their descendent Lamech brags that he will avenge himself seventy-seven fold. In other words, he was like a mobster or a terrorist who loved to shed blood and never showed mercy to anyone. While our desire for revenge surely does not go as far as that, we do find it almost impossible to forgive seventy times seven as Christ forgives us. Like any other area of weakness in the Christian life, our struggle to forgive must begin with an honest acknowledgement before God that we hold a grudge against someone else, that we have not forgiven that person. Even as we ask for God’s forgiveness, we should ask for His help in being reconciled and forgiving completely whatever wrong has been done. We must also pray for those who have offended us, asking God’s blessings on them. And when we are tempted to remember what they have done or to judge them, we must immediately turn our attention to the Jesus Prayer and remembrance of our own need for mercy and forgiveness from the Lord and from those whom we have offended throughout the course of our lives. We need to recognize that we are not the blameless judges of others, but those who stand in constant need of grace, mercy, and healing together with those who have wronged us. It is a long struggle, but if we consistently turn away from unholy thoughts, we know that they will lose their power over us. “Resist the devil and he will flee from you.” (James 4:7) The less attention we give to our temptations, the more they will diminish. Overtime, we will grow in forgiveness from our hearts and learn to replace grudges and resentment with love, to be at peace with our enemies, as much as it depends on us. The challenge is greater, of course, if the others involved in these relationships continue offending us and acting like our enemies. Many would tell us that we are fools to keep forgiving someone a second, third, or fourth time. But remember what the one who told us to forgive seventy-times seven said from the cross, “Father, forgive them for they know not what they do.” There is no limit to the forgiving love of Jesus Christ. And if we are in Him, there can be no limit on our forgiveness either. We who want His mercy must show it to others. Otherwise, we reject Him and condemn ourselves. It may be impossibly hard for us to remember when we are angry with someone, but every human being bears the image of God. In that we have done it to anyone, we have done it to Him. Few of us have the spiritual health and vision to see the Lord’s image even in those who have offended us. But we must remember the words of St. John: “If someone says, ‘I love God,’ and hates his brother, he is a liar.” (1 John 4:20) It is only by the power of the Holy Spirit in our hearts and souls that we will find the strength to stop lying in this way, to treat others as we would treat our Lord Himself. Obviously, Christ has done us no wrong; we need His forgiveness, not the other way round. The more we share in His life, the more we will share in His love by forgiving those who have wronged us. We fool only ourselves by thinking that we may accept His mercy without also showing that mercy to those who have wronged us. It is time for us all to put on Christ and relate to others as He relates to us. If we refuse that calling, we hurt only ourselves. But if we embrace that calling, we will play our unique role in the salvation of the world.